With all the turmoil that preceded the beginning of the Coyotes' 2009-10 season, could anyone have possibly guessed that they would be 21 games over .500 with 12 games to go in the season? Phoenix is currently on a six-game winning streak and has a five-point lead over Colorado for home-ice advantage in the Western Conference playoffs. Dave Tippett has provided the Coyotes with a style of play that allows them to prosper and highlight their strengths. 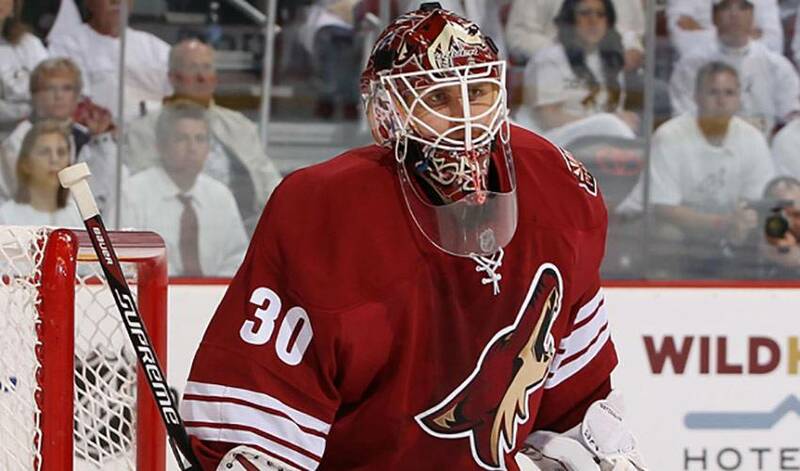 With Ilya Bryzgalov serving as a strong last line of defence (37 wins, 2.25 GAA and a league-leading eight shutouts), the Coyotes find ways to win that doesn't include high-powered offensive threats and wild end-to-end pace. Phoenix got off to a strong start early in the season as teams overlooked them and have continued to win as their reputation as a solid hockey club has grown. The 2001-02 season was the last time that the Coyotes sniffed postseason action, but that is a streak that will surely be ended this year. Phoenix snuck into the playoffs that year with 40 wins and, with the team already notching 43 victories this season, they seem poised to make it back to the post-season dance. The Red Wings find themselves in a rare spot this late in the season, as they are fighting for their playoffs lives. The perennial front-runners have had their troubles this year and their usual placement atop the Central Division is now occupied by Chicago, with a 14-point cushion separating them. However, at press-time, the Red Wings still occupy a playoff position, precarious as it may be. If they reach post-season play, Jimmy Howard will deserve a great deal of the credit for helping them get there. Performing as a rookie starting goaltender on a veteran team is far from easy, yet the Ogdensburg, NY native has handled it well, surpassing many pundits expectations. This past week was a prime example of how the 25-year old has taken control of the Detroit net and given his team a chance each and every night. With every game so critical in the standings, Jimmy won all three of his starts, beating Minnesota, Buffalo and the Flames in an absolute must-win on the road in Calgary. His stats in those three games: 3-0, 1.33 GAA and a .943 SV%. As the Wings breathe down the necks of the Predators, the Flames are most certainly breathing down theirs and if the Wings advance beyond the regular-season, you can look to a save off a Curtis Glencross penalty-shot attempt as a tipping point. In a 1-1 game, Glencross wound up for his attempt by circling back to the Calgary net and advancing at full-speed on the young netminder, but Jimmy was undeterred. Standing tall, he turned away the shot by Glencross, punctuated it with a small fist pump and then turned away every shot he faced afterwards to preserve the crucial win and punctuate a stellar week for himself and the Red Wings. Chris Stewart has certainly been on a tear lately, with points in his last six games, but his accomplishments against one particular team this season are nothing short of incredible. In four games against St. Louis this year, Chris has completely lit up the Blues, scoring seven goals and setting up teammates for 5 more. Those seven goals include two game-winners, helping lead the Avalanche to a 4-0 record against St. Louis for the season. On Tuesday night, Chris had his least productive game of the season against the Blues, “only” scoring a goal and an assist as the Avs won 5-3. Steve Mason may have suffered through a sophomore slump and Kris Versteeg may be one of the minor acts on the Blackhawks marquee, but Bobby Ryan just about matched his Calder-nominee rookie season with 13 games yet to be played. Last season, Bobby scored 31 goals and assisted on 26 others, finishing a very strong freshman campaign with 57 points in only 64 games. After scoring two goals against Chicago on Wednesday night, Bobby reached the 31-goal mark again, celebrating his 23rd birthday in style. With 25 assists as well, Bobby is putting up his strongest numbers to date and will undoubtedly eclipse his totals in scoring from his rookie season. One that has already been shattered though is Bobby's penalty minute mark, as his 33 of last season is nothing next to the 75 he has this year. At age 42, Mark Recchi is one of the elder statesmen of the NHL and he has enjoyed a highly productive career. Having been in the league since 1988-89, Mark has accumulated some impressive statistics and hit some lofty benchmarks. With a goal against the Hurricanes on Tuesday night, Mark found the back of an NHL net for the 560th time, putting him in a tie with Guy Lafleur for 22nd place on the all-time goals-scored list. Joe Nieuwendyk and Mats Sundin just sit ahead of him, tied for 20th place with 564. Congratulations from NHLPA.com on reaching this outstanding accomplishment Mark! - Matt Bradley, of the Carolina Hurricanes, describes the visit that he, Brooks Laich, Eric Fehr, Brendan Morrison and Jeff Schultz paid to the Children's National Medical Center to meet and spend time with some of the sick children there.